Parents, these Family Resources are for you. 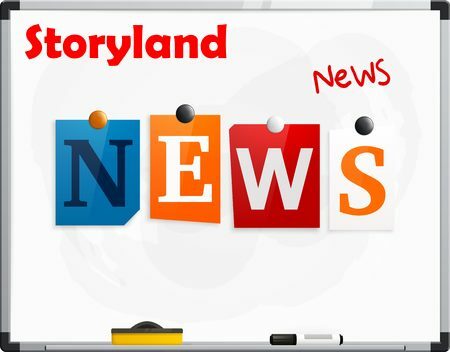 We'll try to keep you up to date on everything that's happening here at Storyland. 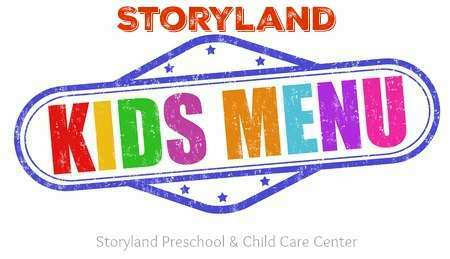 All Families: Whether you are already a member of our Storyland family or are considering the option, you have come to the right place. Scroll down or click here for Information of interest to perspective families. Current Families: Check out our Calendars, Menus, Newsletters and Handbooks: Scroll down the page to view options and click on the links to obtain information you need. Check out our combined Calendar and Newsletter that you can either read online or download a pdf copy that can be printed or referred to all month. Never miss another important date. Read the Current Calendar online now. Find out what's for lunch (or breakfast, or snack). 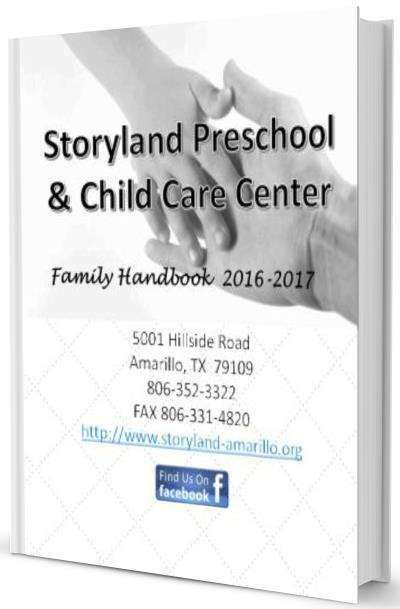 You can read it read it online or download and copy or comeback to this page everyday and let your child know what they can expect to eat at Storyland. Our newest Family Handbook for the School Year 2019-2020 is now available. How would you like to read it? Would you prefer to download a PDF Copy to Read and Save? Click Here. We hope you will consider us for your child care needs. 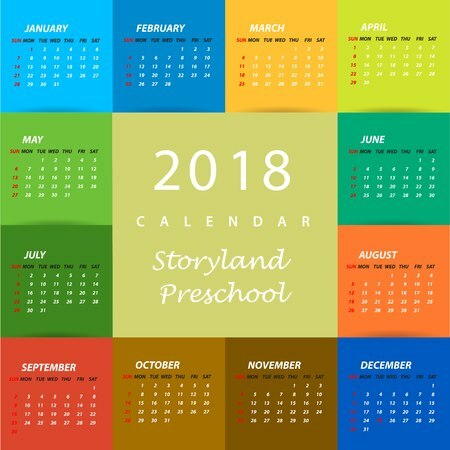 If you think that Storyland Preschool and Child Care Center would be a good fit for you and your child, we encourage you to contact us for availability of space. If space is available, we will invite you to come and visit, take a tour, and meet the teachers. If an opening exists and you are interested, a Registration Fee will hold your spot. You will also need to complete a series of forms and submit them prior to your child's first day. All of the forms that you need are provided below. They can be printed and filled out by hand or filled in online and then printed. We must have the hard copies of forms when you come to register. 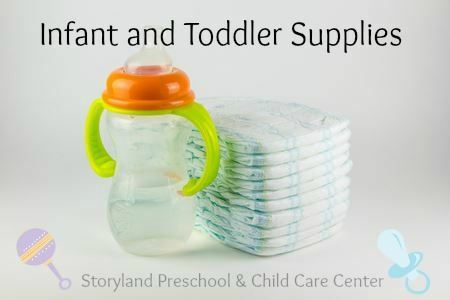 This supply list is for parents of new infant and toddler children. Please make sure that everything is brought to school marked with your child's first name and first initial of last name on the first day of school. Want a PDF of the Infant Supply list that you can download and copy? Download Here. 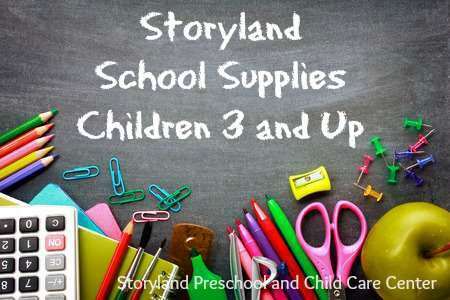 This supply list is for parents of new children age 3 and older including school age children. Please make sure that everything is brought to school marked with your child's first name and first initial of last name on the first day of school. One or more changes of clothing. Child’s nap mat. Not needed for school age children. Blanket & small travel pillow if desired.